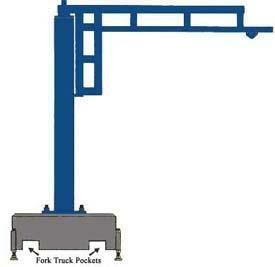 Cost effective solution for lifting needs that can be covered within the radius created by the jib crane. Well-suited for use beneath traveling industrial cranes, in open areas where they serve several work cells. Anchor bolt kits and templates designed to allow for easy and accurate installation of anchor bolts are available for all floor mounted free standing jib cranes. Workstation jib cranes are available constructed from standard I-beams or for smaller capacities enclosed rail type jibs can be provided. 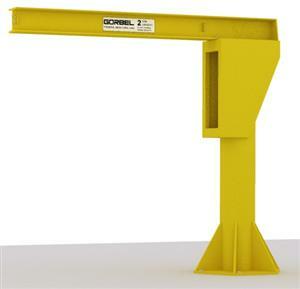 Enclosed rail jibs are utilized when capacities are between 100 lb. to 1000 lb. and with spans up to 16 ft. The enclosed rail design on the boom reduces dead weight which allows for easier rotation than a standard I-beam jib crane. Large capacities and longer spans. Can be equipped with powered rotation and powered trolleys. Many existing jibs can even have motorized rotation added to them with one of our power rotation kits after the jib has been installed. Foundation requirements for free standing jib cranes range from utilizing existing concrete floors that are as thin as 6 inches to large foundations that can be up to 5 ft deep and 11 ft. square. CraneWerks can provide jib foundations through a nationwide network of concrete specialists that we employ to accomplish turn-key installations of workstation jib cranes and other systems that require foundations. Light capacities and short span jib cranes can in some cases be mounted onto portable bases that can be moved from place to place with a lift truck. The floor coverage of a jib crane placed in a square work space is round, leaving many areas of the work cell not covered by the jib, wasting valuable production space. Jib cranes accommodate the following lifting devices: wire rope, electric, and air powered chain hoists, chain fall hoists, vacuum lifters and balancers. 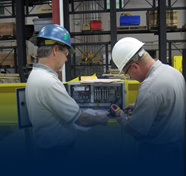 Whether it’s a small workstation jib crane or a large motorized jib crane our trained crane and hoist specialists are standing by to assist you in any way possible. If you have questions about jib cranes or any other equipment please call 888-544-2121 or email sales@cranewerks.com and we will be more than happy to assist you. If you know what you’re looking for, please fill out our request for quote forms. Need a quote in a hurry? Most Free Standing Jib Cranes can be quoted same day if necessary.